Weather: Praia a Mare: Scattered clouds, 24°C. Wind: weak – 6 kmh. Benevento (approx. 17.15 – Finish): Light cloud, 25°C. Wind: moderate – 20 kmh. The Route: This very long stage (233km) winds its way mostly on fast-flow roads. The first part runs entirely uphill (with milder or harsher gradients), with constant undulations further on, up to 30km remaining to the finish. The final part leading into Benevento runs slightly downhill, until it reaches the city for the last section. The final kilometers run entirely within the city. The first part rolls on wide and straight avenues, climbing at first, and then descending. The second part runs on more narrow and curvy inner streets, with a sharp turn 1,200m before the finish. The home stretch is 200m long and slightly uphill, on a 7m wide porphyry-paved road. The Race: 195 riders started at 11:30. Giant-Alpecin made this stage report. 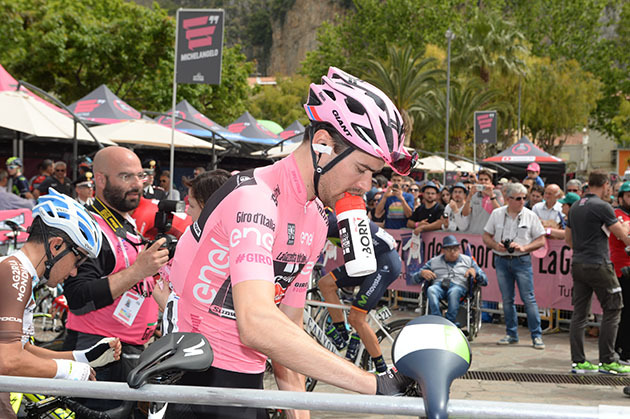 After a controlled start to the longest stage of the Giro d’Italia, a breakaway of four guys finally managed to jump away from the peloton after the only climb of the day with 40km of racing completed. The break saw their advantage max out at almost six minutes before they were gradually reeled back in, with our guys and Lotto Soudal taking the lion’s share of the chase duties. Dumoulin’s teammates kept their leader well protected and positioned with the riders working hard from the beginning to the end of the stage. The breakaway worked well together but a motivated peloton saw the race come back together with 10km as the race headed towards a likely bunch sprint. In what was a nervous finale for the riders, Albert Timmer was involved in a minor crash but was quickly back on his bike and able to continue the race. 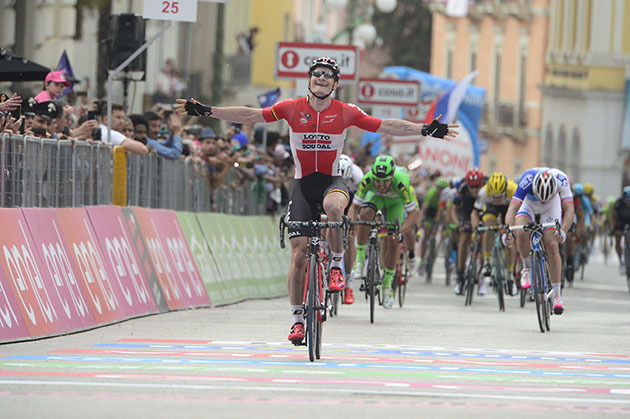 In the finish, Dumoulin crossed the line in 28th place as Greipel was the fastest in the sprint. Nikias Arndt was in a good position with Bert de Backer but he got boxed in with 1km to go which ruined his chances for a good result. However, Georg Preidler continued his good run of form as he sprinted to an 8th place finish. 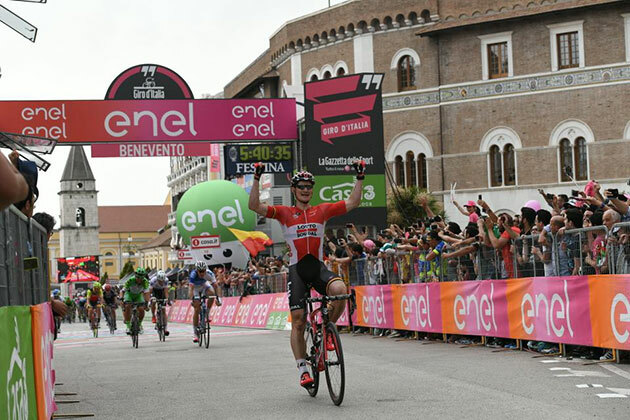 That result means there were no significant changes in the general classification with Dumoulin 16″ ahead of Bob Jungels (Etixx Quick-Step) in the battle for the pink jersey. Georg Preidler is now up to 4th overall. 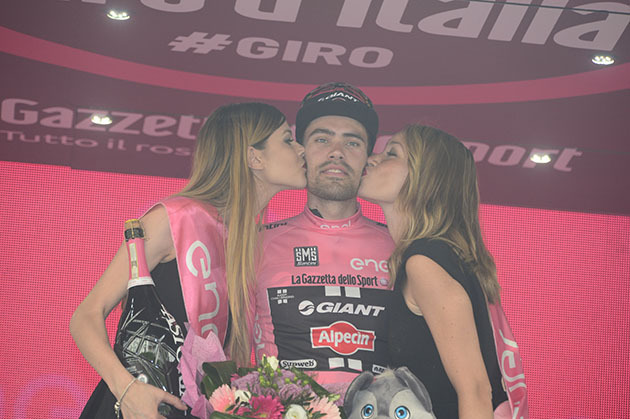 Tom Dumoulin's keeping the Maglia Rosa today allowed him to join his compatriot Peter Weening with 4 days as Giro d’Italia race leader. Of Dutch riders, only Erik Breukink has more days in the Maglia Rosa, with 8. 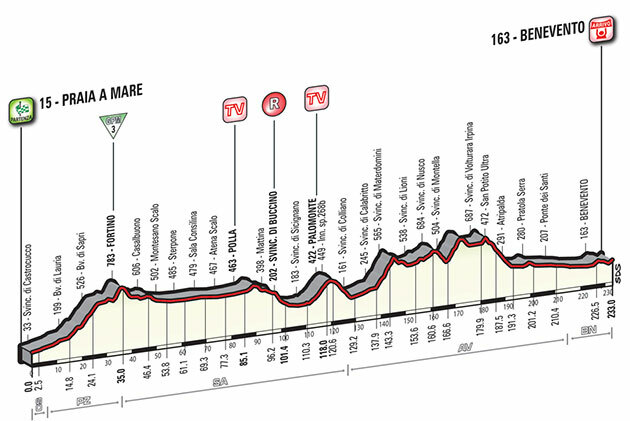 Weening won stage five on 11 May 2011 (Piombino-Orvieto), which took in some of the dirt tracks used in Strade Bianche. 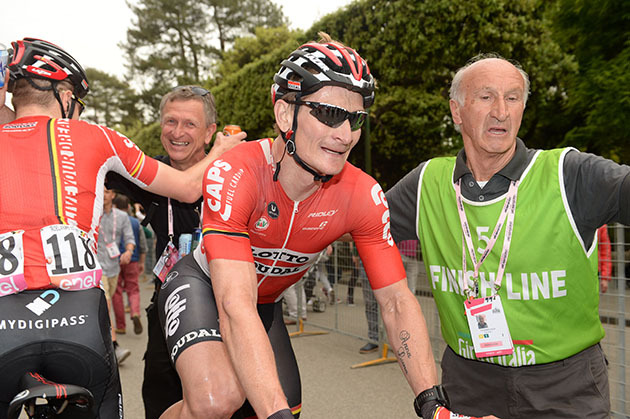 Seconds after the stage finish, stage winner André Greipel said: “It was a really hard chase to bring the four breakaway riders back. Luckily other teams helped but I owe a big thanks to my team. They are a big part of this success. Before the start, I said it would be a nice finish for me and it really was. I was behind the crash [involving Rein Taaramae] but I found my way through and launched my sprint when I saw a gap with 300 metres to go. I hesitated a bit, then I gave it everything. I’m really happy”. 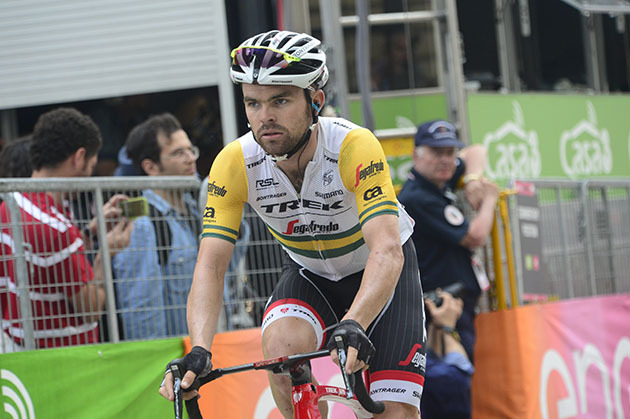 Race leader Tom Dumoulin said: “I was told the Giro is a difficult race. Now I know why. Today it was up and down all day and the peloton went crazy in the finale. I didn’t bother when Bob Jungels went for the sprint because the bonus of four seconds that he could have taken isn’t much. I just looked after myself and that was already hard enough”. 2 DEMARE Arnaud FDJ s.t. 3 COLBRELLI Sonny BARDIANI CSF s.t. 4 JUNGELS Bob ETIXX-QUICK STEP s.t. 5 HOFLAND Moreno LOTTO NL-JUMBO s.t. 6 BELLETTI Manuel WILIER TRIESTINA s.t. 7 ZABEL Rick BMC s.t. 8 PREIDLER Georg GIANT-ALPECIN s.t. 9 EWAN Caleb ORICA-GREENEDGE s.t. 10 TCATEVITCH Alexey KATUSHA s.t. 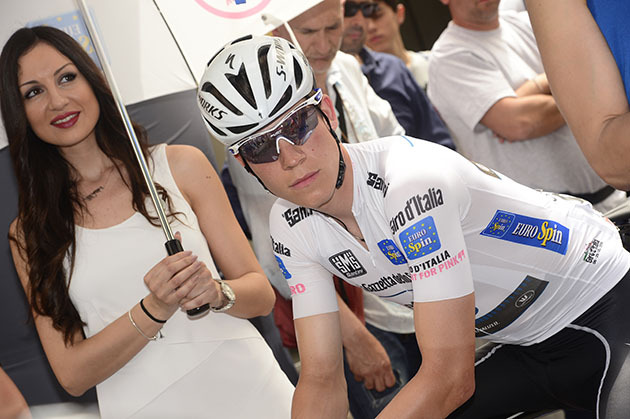 11 SBARAGLI Kristian DIMENSION DATA s.t. 12 ZAKARIN Ilnur KATUSHA s.t. 13 VALVERDE Alejandro MOVISTAR s.t. 15 MEZGEC Luka ORICA-GREENEDGE s.t. 16 NAVARDAUSKAS Ramunas CANNONDALE s.t. 17 LANDA Mikel SKY s.t. 18 SAVITSKIY Ivan GAZPROM-RUSVELO s.t. 19 NIBALI Vincenzo ASTANA s.t. 20 BRAMBILLA Gianluca ETIXX-QUICK STEP s.t. 21 MAJKA Rafal TINKOFF s.t. 22 HAUSSLER Heinrich IAM CYCLING s.t. 23 ULISSI Diego LAMPRE - MERIDA s.t. 24 BETTIOL Alberto CANNONDALE s.t. 25 KRUIJSWIJK Steven LOTTO NL-JUMBO s.t. 26 CHAVES Esteban ORICA-GREENEDGE s.t. 27 FIRSANOV Sergey GAZPROM-RUSVELO s.t. 28 DUMOULIN Tom GIANT-ALPECIN s.t. 29 POZZOVIVO Domenico AG2R LA MONDIALE s.t. 30 SIUTSOU Kanstantsin DIMENSION DATA s.t. 31 MODOLO Sacha LAMPRE - MERIDA s.t. 32 URAN URAN Rigoberto CANNONDALE s.t. 33 VERONA Carlos ETIXX-QUICK STEP s.t. 34 FUGLSANG Jakob ASTANA s.t. 35 KOCHETKOV Pavel KATUSHA s.t. 36 AMADOR Andrey MOVISTAR s.t. 37 DE LA CRUZ David ETIXX-QUICK STEP s.t. 38 FORMOLO Davide CANNONDALE s.t. 39 PIRAZZI Stefano BARDIANI CSF s.t. 40 MONFORT Maxime LOTTO-SOUDAL s.t. 41 KANGERT Tanel ASTANA s.t. 42 SCARPONI Michele ASTANA s.t. 43 MONTAGUTI Matteo AG2R LA MONDIALE s.t. 44 CARDOSO Andre Fernando CANNONDALE s.t. 45 HENAO Sebastian SKY s.t. 46 KUDUS GHEBREMEDHIN Merhawi DIMENSION DATA s.t. 47 MALACARNE Davide ASTANA s.t. 48 KUNG Stefan BMC s.t. 49 HESJEDAL Ryder TREK-SEGAFREDO s.t. 50 ZEITS Andrey ASTANA s.t. 51 NIZZOLO Giacomo TREK-SEGAFREDO s.t. 52 ANTON HERNANDEZ Igor DIMENSION DATA s.t. 53 MORI Manuele LAMPRE - MERIDA s.t. 54 BONNAFOND Guillaume AG2R LA MONDIALE s.t. 55 TANKINK Bram LOTTO NL-JUMBO s.t. 56 PORSEV Alexander KATUSHA s.t. 57 VISCONTI Giovanni MOVISTAR s.t. 59 POLJANSKI Pawel TINKOFF s.t. 60 DUPONT Hubert AG2R LA MONDIALE s.t. 61 WYSS Marcel IAM CYCLING s.t. 62 CONTI Valerio LAMPRE - MERIDA s.t. 63 POZZATO Filippo WILIER TRIESTINA s.t. 64 NIEVE Mikel SKY s.t. 67 ATAPUMA Darwin BMC s.t. 68 KOLOBNEV Alexandr GAZPROM-RUSVELO s.t. 69 SILIN Egor KATUSHA s.t. 72 ROVNY Ivan TINKOFF s.t. 73 TRENTIN Matteo ETIXX-QUICK STEP s.t. 78 MOSER Moreno CANNONDALE s.t. 81 DELAGE Mickael FDJ s.t. 82 ALAFACI Eugenio TREK-SEGAFREDO s.t. 87 CUNEGO Damiano NIPPO-VINI FANTINI s.t. 88 ROSSKOPF Joseph BMC s.t. 95 AGNOLI Valerio ASTANA s.t. 96 HANSEN Adam LOTTO-SOUDAL s.t. 97 FISCHER Murilo Antonio FDJ s.t. 98 DOMONT Axel AG2R LA MONDIALE s.t. 99 BROWN Nathan CANNONDALE s.t. 104 TUFT Svein ORICA-GREENEDGE s.t. 105 HEPBURN Michael ORICA-GREENEDGE s.t. 106 LIGTHART Pim LOTTO-SOUDAL s.t. 108 KUZNETSOV Viacheslav KATUSHA s.t. 114 BONGIORNO Francesco Manuel BARDIANI CSF s.t. 115 WISNIOWSKI Lukasz ETIXX-QUICK STEP s.t. 116 RODRIGUEZ Cristian WILIER TRIESTINA s.t. 117 MAESTRI Mirco BARDIANI CSF s.t. 118 PETILLI Simone LAMPRE - MERIDA s.t. 119 FILOSI Iuri NIPPO-VINI FANTINI s.t. 120 BRUTT Pavel TINKOFF s.t. 123 RUFFONI Nicola BARDIANI CSF s.t. 124 SENNI Manuel BMC s.t. 125 CASTELIJNS Twan LOTTO NL-JUMBO s.t. 126 VAN EMDEN Jos LOTTO NL-JUMBO s.t. 127 SERRY Pieter ETIXX-QUICK STEP s.t. 128 CANCELLARA Fabian TREK-SEGAFREDO s.t. 129 QUINZIATO Manuel BMC s.t. 130 ZOIDL Riccardo TREK-SEGAFREDO s.t. 131 COLEDAN Marco TREK-SEGAFREDO s.t. 132 VAN POPPEL Boy TREK-SEGAFREDO s.t. 133 HERNANDEZ Jesus TINKOFF s.t. 134 VAN ZYL Johann DIMENSION DATA s.t. 135 VOROBYEV Anton KATUSHA s.t. 136 CLARKE Simon CANNONDALE s.t. 137 BOSWELL Ian SKY s.t. 138 KOZHATAYEV Bakhtiyar ASTANA s.t. 139 BEWLEY Sam ORICA-GREENEDGE s.t. 140 DEIGNAN Philip SKY s.t. 142 ROGLIC Primoz LOTTO NL-JUMBO s.t. 143 SUTHERLAND Rory MOVISTAR s.t. 144 MORENO Javier MOVISTAR s.t. 145 ZHUPA Eugert WILIER TRIESTINA s.t. 146 SUTTERLIN Jasha MOVISTAR s.t. 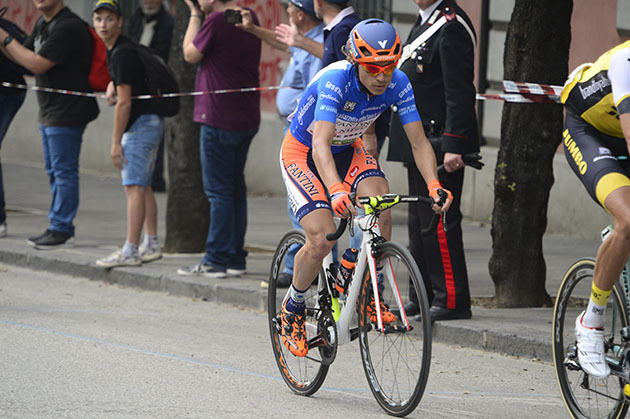 147 STACCHIOTTI Riccardo NIPPO-VINI FANTINI s.t. 148 LE GAC Olivier FDJ s.t. 149 HERRADA LOPEZ José MOVISTAR s.t. 150 CICCONE Giulio BARDIANI CSF s.t. 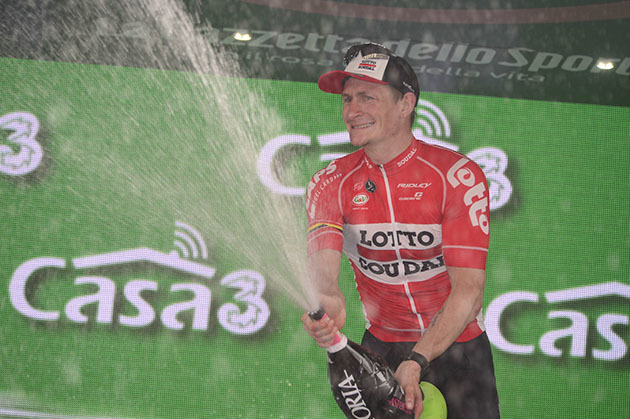 151 BAK Lars Ytting LOTTO-SOUDAL s.t. 152 VAUGRENARD Benoit FDJ s.t. 153 COURTEILLE Arnaud FDJ s.t. 154 YAMAMOTO Genki NIPPO-VINI FANTINI s.t. 155 AMEZQUETA Julen WILIER TRIESTINA s.t. 156 BOEM Nicola BARDIANI CSF s.t. 157 MARTINEZ Daniel WILIER TRIESTINA s.t. 158 DIDIER Laurent TREK-SEGAFREDO s.t. 159 WARBASSE Lawrence IAM CYCLING s.t. 161 KITTEL Marcel ETIXX-QUICK STEP s.t. 162 JIM Songezo DIMENSION DATA s.t. 163 THOMSON Jay Robert DIMENSION DATA s.t. 164 BOLE Grega NIPPO-VINI FANTINI s.t. 165 STAMSNIJDER Tom GIANT-ALPECIN s.t. 166 DE BACKER Bert GIANT-ALPECIN s.t. 167 DOMBROWSKI Joseph Lloyd CANNONDALE s.t. 168 BELKOV Maxim KATUSHA s.t. 169 SOLOMENNIKOV Andrey GAZPROM-RUSVELO s.t. 170 FOLIFOROV Alexander GAZPROM-RUSVELO s.t. 171 SEROV Alexander GAZPROM-RUSVELO s.t. 172 CAPECCHI Eros ASTANA s.t. 173 KOSHEVOY Ilia LAMPRE - MERIDA s.t. 176 DE MARCHI Alessandro BMC s.t. 177 LOPEZ GARCIA David SKY s.t. 178 KADRI Blel AG2R LA MONDIALE s.t. 179 ANDREETTA Simone BARDIANI CSF s.t. 180 RYBALKIN Aleksey GAZPROM-RUSVELO s.t. 181 ERSHOV Artur GAZPROM-RUSVELO s.t. 182 OVECHKIN Artem GAZPROM-RUSVELO s.t. 183 DE BIE Sean LOTTO-SOUDAL s.t. 184 VANENDERT Jelle LOTTO-SOUDAL s.t. 185 WELLENS Tim LOTTO-SOUDAL s.t. 188 TIMMER Albert GIANT-ALPECIN s.t. 189 HAGA Chad GIANT-ALPECIN s.t. 190 ZILIOLI Gianfranco NIPPO-VINI FANTINI s.t. 193 PELUCCHI Matteo IAM CYCLING s.t. 4 PREIDLER Georg GIANT-ALPECIN s.t. 11 CHAVES Esteban ORICA-GREENEDGE s.t. 14 TAARAMAE Rein KATUSHA s.t. 17 SIUTSOU Kanstantsin DIMENSION DATA s.t. 22 FIRSANOV Sergey GAZPROM-RUSVELO s.t. 23 BRAMBILLA Gianluca ETIXX-QUICK STEP s.t. 25 KANGERT Tanel ASTANA s.t. 29 BUSATO Matteo WILIER TRIESTINA s.t. 33 NIZZOLO Giacomo TREK-SEGAFREDO s.t. 36 KUNG Stefan BMC s.t. 39 SBARAGLI Kristian DIMENSION DATA s.t. 46 CONTI Valerio LAMPRE - MERIDA s.t. It's great to see Damiano Cunego wearing the mountains classification leader's jersey. A decade ago he was the magic man and won the Giro in 2004. 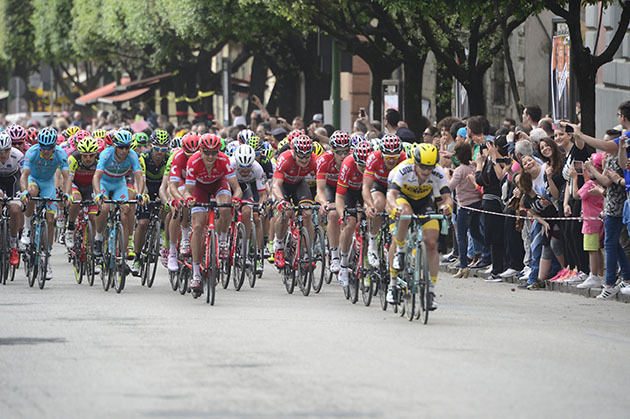 The peloton speeding through the finish town of Benevento. André Greipel nails the sprint. 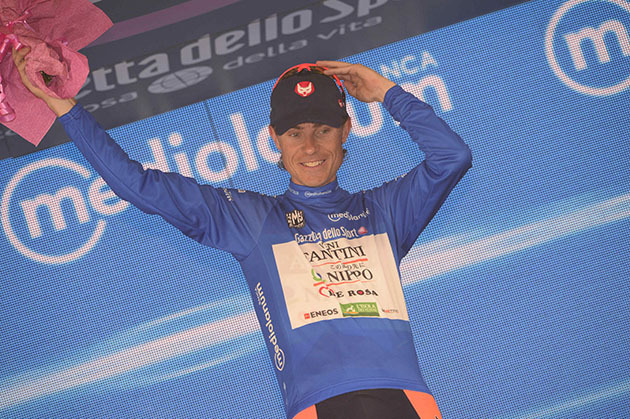 And Damiano Cunego gets another day in the climber's blue jersey.